East Punjab Holdings (Consolidation and Prevention of Fragmentation) Act, 1948, S.42–Revision–Non providing of passage-Application filed after 40 years of consolidation- Application was allowed without considering the explanation- Matter remanded. Comments Off on East Punjab Holdings (Consolidation and Prevention of Fragmentation) Act, 1948, S.42–Revision–Non providing of passage-Application filed after 40 years of consolidation- Application was allowed without considering the explanation- Matter remanded. 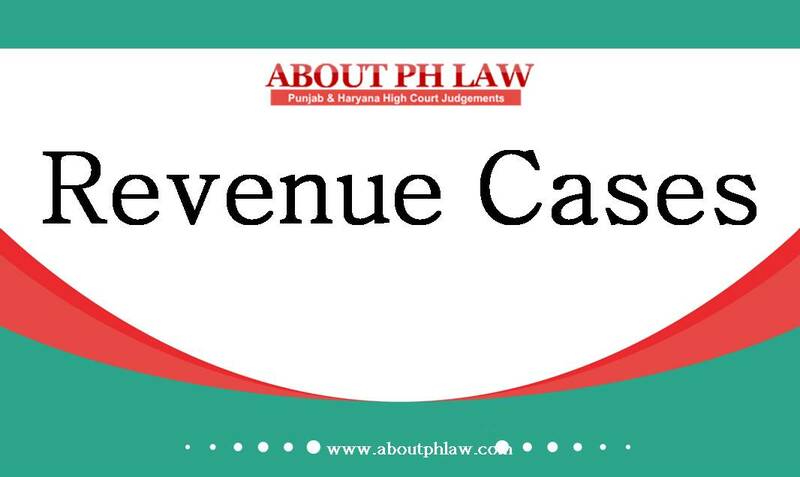 Punjab Land Revenue Act, 1887, S.44–Revenue Records-The entries in jamabandi are not proof of in respect of an irremovable property-Entries made by patwari in official record are only for the purpose of records and do not by itself prove the correctness of the same nor can statutory presumption be: drawn on the same, particularly, in the absence of corroborative evidence. Comments Off on Punjab Land Revenue Act, 1887, S.44–Revenue Records-The entries in jamabandi are not proof of in respect of an irremovable property-Entries made by patwari in official record are only for the purpose of records and do not by itself prove the correctness of the same nor can statutory presumption be: drawn on the same, particularly, in the absence of corroborative evidence. Evacuee Property—Occupant cannot claim allotment of land on the pleas that they were/are in its unauthorized occupation since the 1964 or prior thereto as original allottee failed to take possession of land allotted to them being Displaced Person’. Comments Off on Evacuee Property—Occupant cannot claim allotment of land on the pleas that they were/are in its unauthorized occupation since the 1964 or prior thereto as original allottee failed to take possession of land allotted to them being Displaced Person’. Punjab Tenancy and Agricultural Lands Act, 1955, S.7–Eviction—Non payment of rent—Extension of time—Once the statute prescribes a period for compliance of a particular act, the time cannot be extended unless there is a specific provision in the statute conferring such power on an authority. Comments Off on Punjab Tenancy and Agricultural Lands Act, 1955, S.7–Eviction—Non payment of rent—Extension of time—Once the statute prescribes a period for compliance of a particular act, the time cannot be extended unless there is a specific provision in the statute conferring such power on an authority. Since the Gram Panchayat has lost its title qua the subject-land in favour of respondent and those orders have attained finality, the petitioners have no locus-standi or cause of action to challenge those orders as they had merely stepped into the shoes of the Gram Panchayat. Comments Off on Since the Gram Panchayat has lost its title qua the subject-land in favour of respondent and those orders have attained finality, the petitioners have no locus-standi or cause of action to challenge those orders as they had merely stepped into the shoes of the Gram Panchayat. East Punjab Holdings—Order was passed without opportunity of hearing-Matter remanded to consolidation officer after 23 years of passing such an order. Comments Off on East Punjab Holdings—Order was passed without opportunity of hearing-Matter remanded to consolidation officer after 23 years of passing such an order. Wakf Property—Civil court does not have jurisdiction to evict gair marusi tenant from wakf property. Comments Off on Wakf Property—Civil court does not have jurisdiction to evict gair marusi tenant from wakf property. Wakf Tribunal—Eviction—Once the occupant becomes statutory tenant, the Wakf tribunal would not have any jurisdiction to try and decide the suit. Comments Off on Wakf Tribunal—Eviction—Once the occupant becomes statutory tenant, the Wakf tribunal would not have any jurisdiction to try and decide the suit.